The GS Avanti kit is supplied by Kalas Sportswear, a specialist supplier of customised cycling clothing. The Kalas kit orders are placed in 2 week windows. Orders can be placed from the 1st of the month up until the 14th of the month. The 15th of the month the club shop will be closed and the order will be processed and production will take 4-6 weeks. The shop remains closed for the remainder of the month. The 1st day of the next month the shop reopens. Orders will be delivered to the kit coordinator for distribution to members. The kit shop is usually open for the first two weeks of each calendar month. If five or more items are ordered, the shop will close with a delivery in 4-6 weeks which means the second half of the following calendar month. If we have fewer than five items on order, the shop will stay open until we get at least five items (this rarely happens). To save on delivery costs, all ordered items will be delivered to the kit manager. Once delivered, we will drop all items at Cycles UK in Orpington for collection at your convenience (the shop is open seven days a week). You will receive an individual email when your item is in Cycles UK ready for collection. 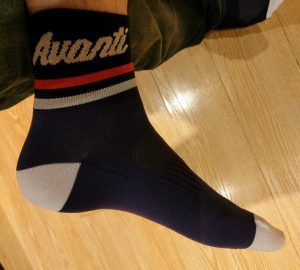 Any member of the staff will be able to help you when you just say you are an Avanti member and your name. Kalas is the supplier of the GS Avanti kit and any purchases are a transaction between you and Kalas. All costs and payment details are on the Kalas Club Shop website. The Kalas shop currently has a selection of designs that have been agreed upon with the supplier and designers. If you are interested in other items you can see the full range at the Kalas website here. Also you can check out the full range in their catalogue here. Please get in touch with the kit coordinator at kit@gsavanti.co.uk if you would like more items added to the range. Note that the designs in the shop on each item show the generic Kalas design, not the Avanti design – rest assured your order will be made up in the Avanti design as shown on our website. The club offers a £25 discount on kit each calendar year. Once you have ordered and received your kit, send a copy of your invoice and your bank account details to the treasurer at treasurer@gsavanti.co.uk for a refund. You can have your name added to your kit – £4.80 per item. Also you can have a flag if you want to show off your nationality – an additional £4.80 per item. This has to be arranged directly with Kalas – so if you want this – then please contact kit@gsavanti.co.uk to arrange once you have placed your web shop order. There is a full mens and womens range of kit in identical options. Note that the sizing of this top is less flexible than the other tops – and it’s recommended to go a size up if you are borderline between 2 sizes. If in doubt – please ask the kit manager or other members who already have this top. Razor – tight-fitting aero race jersey. Carbon X7 – streamlined but not too-close fit woven with carbon for lightweight breathability. Verano Ultra – ultra-lightweight, close-fit and breathable for hot-weather. RainMem – breathable water-resistant membrane fabric similar to Castelli Gabba – available in long and short sleeves. 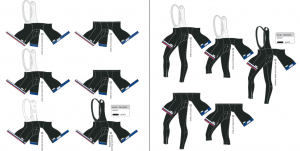 There are bib shorts and tights in 3 finishes – both have a really comfortable pad and silicone grippers on the thigh. Arco Elite Power – entry-level – great all-round shorts. Arco Pro Goffrato – the result of testing and active collaboration with professional teams. Made from compressive and highly functional Goffrato fabric. A new and carefully elaborated cut provides better aerodynamics and ensures maximum comfort when riding. Arco Pro RainMem – breathable water-resistant membrane fabric – keeps you toasty in the Winter. Similar to Castelli Nanoflex. Elite – mid-range, form-fitting, good for most club members. Pro Cyclo-One – advanced, ultimate aero-performance – no compromises. Beware – hard to put on and very tricky to stand up in. Elite Gamex – very lightweight summer gilet with no pockets. Elite W&W Mission Light 03 – lightweight windproof, water-resistant membrane on front, mesh and 3 pockets on the back. Elite W&W Mission Light 05 – lightweight windproof, water-resistant membrane on front and back with 3 pockets on the back. Pro Hex – new for 2017 – ultra lightweight, packable waterproof but with no pockets. Elite Gamex – very lightweight wind-proof Spring/Autumn jacket with 3 pockets on the back. Elite W&W Mission Light – lightweight windproof, water-resistant membrane front and back with 3 pockets on the back – just like the W&W 05 gilet. Also has detachable sleeves to convert into gilet. Elite W&W Winter Plus – fleece-lined windproof, water-resistant membrane with 3 back pockets. Pro W&W Diamond – similar to the Pro Rainmem but for ultimate cold weather protection – includes a built-in balaclava. Might be overkill for the South East of England. Pro Hex – ultra-lightweight, taped seam waterproof rain jacket – close-fitting for training/racing in the rain. Packs down well. Accessories can no longer be purchased through the shop as we need to have a minimum order of 10 of each item – but we are keeping stock of some items to sell to members – get in touch kit@gsavanti.co.uk to let us know if you want any accessories – caps, arm warmers, track mitts, aero shoe covers and now some snazzy socks.